LLADRO GALLOP I figurine with gift box. Sculptor: Alfredo Lorens, Release year 2003. This pure white matt porcelain sculpture of a stunning stallion in a mid-gallop is a beautiful classic sculpture which is guaranteed to look wonderful within your home. The audacious and fiery horse with its flowing main and tail seems to be running towards the limitless horizon with its strained muscles cutting through the air. 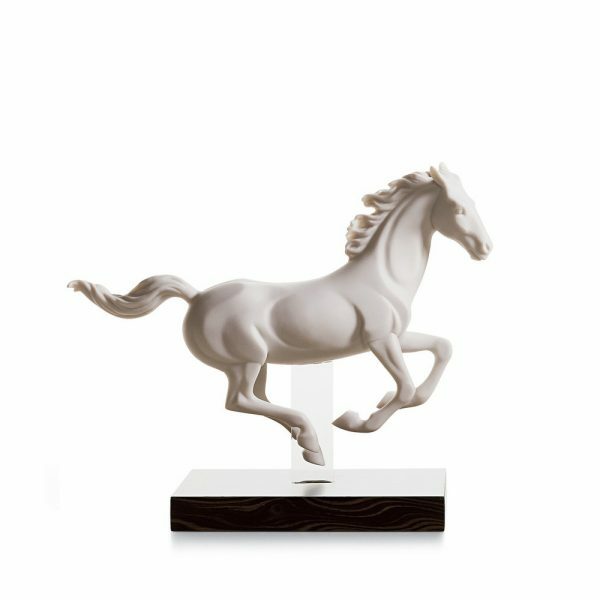 Perfect for horse lovers and someone who appreciates beautiful figurines and is afraid of nothing in his quest to overcome all obstacles. Compra adesso il prodotto ed ottieni 378 Crediti! Buy now and earn 378 Points!